Ranew, Jason - Groelle & Salmon P.A. Jason M. Ranew is an associate attorney focusing on insurance coverage and defense in the firm’s Orlando office. Attorney Ranew is an experienced litigator and trial lawyer. Following law school, Attorney Ranew gained admission to practice law in Ohio and in Florida. 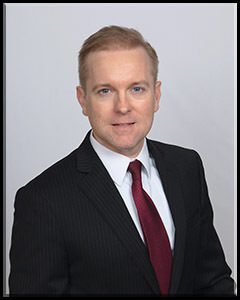 Before moving to Florida, he worked as an associate attorney at a commercial litigation firm in Akron, Ohio, where he gained valuable experience in a wide variety of civil litigation and civil transactional matters. Since moving to Central Florida, his career has included years of experience as a prosecutor for the State of Florida, where he served his community by prosecuting criminal offenders and supporting law enforcement. His prosecutorial duties included significant jury trial experience and matters involving insurance fraud. His litigation matters have spanned courthouses all across Florida and have included representing multiple insurance carriers in a wide variety of matters. His representation of carriers has primarily included windstorm, hurricane, hail, water intrusion, plumbing, and sinkhole matters. Attorney Ranew is admitted to practice law in Florida and Ohio (inactive license). In addition to his Juris Doctor from the University of Akron in Ohio, he earned his M.B.A. in Finance from the University of Akron and his Bachelor of Arts in Finance from Hillsdale College in Michigan. He lives in Central Florida with his wife and children and is actively involved in local community affairs. In his free time, he enjoys general outdoor activities, scuba diving, winter sports, hiking, gardening, reading, music, and traveling with his family. University of Akron College of Law, J.D.